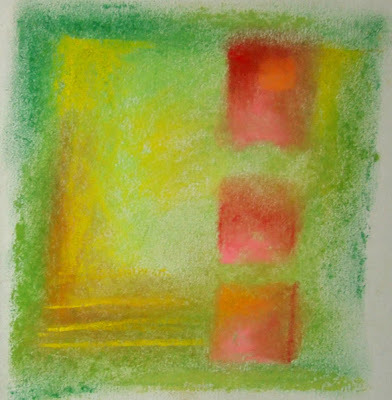 These small pastels - just over 5 inches square, were pure 'playing' with colour interaction - taking complimentary colours and making vibrant little squares of colour as the complimentaries zing against each other. The second one hasn't photographed very well - the magentas are much more glowing in reality than they appear here. The last one makes me think of apples and autumn, the middle one of beaches on one of those deeply vivid blue days and the first late summer harvest time. They were done with Inscribe pastels, which is a very cheap brand but really nice to use and with a wide colour range, I use them alongside my Unisons. 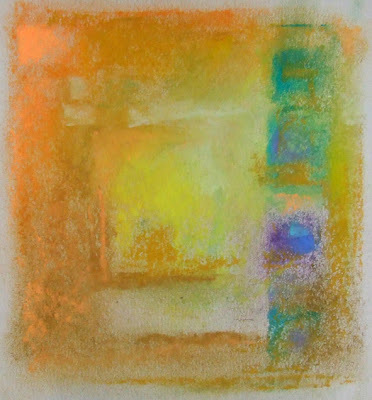 Do you use pastels? what kind? Mainly Unison - and I love the blue one! Unison for me too - but I always have have the Inscribe ones as well (though these belonged to the college) as they do some beautiful colours and they are lovely and soft and not at all expensive. All my pastel brands are mixed together and separated according to colour. I think they are ideal for someone testing out whether or not the will like pastels. These abstracts are delicious! I love them all, Vivien. Did you use a kneaded eraser to pick up some of the green? Diane Townsend taught me to lift out with tools (paper towel, tissue, eraser, etc.) 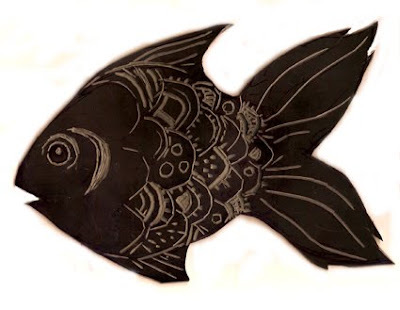 as a way to not finish too early and to add texture, depth and content. Not that these beauties need any changing - they are just wonderful. Do I hear a little bell ringing? little bell ringing would be nice Casey! I do often use a kneaded eraser or the little battery operated erasers to draw back into things but on this occasion I didn't - the drawing back into colour is usually very important in my work. I was going to write an emphatic: "No! I make a dreadful mess." Then I read the comment about colour swatches being a nice way to test the water. Hmmm...maybe I should be more open-minded. 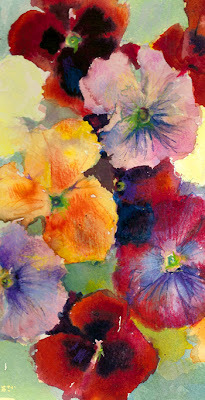 Your work is always such a treat - I really like all of these - just gorgeous rich color! These are beautiful, Vivien. They'll lead to something bigger I bet. I love the look of golds and yellows in particular on grey paper. I'm very excited lately about using coloured papers as a change from white - even for watercolours. I have Faber-Castell Polychromos and Ferrario very soft Italian pastels plus Stabilo Carb-Othello pencils - and it doesn't matter which I use I just don't have what it takes for pastels. Makes me very sad when I look at what you, Casey and Katherine can achieve. 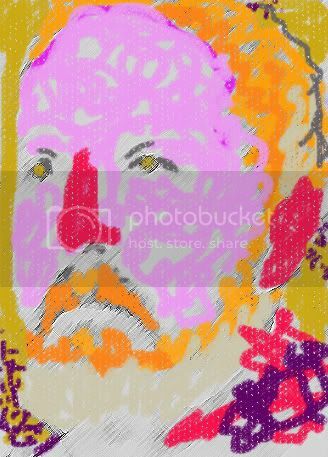 I like the Purple/Bluey one with the Gold background best, my sort of coloure, you still have not said whether you are right or left handed, perhaps a bit of both? What lovely luscious colours! I'm enjoying using pastels for the first time, but I bought pre selected sets of Winsor and Newton soft pastels. However, the Unison pastels look positively addictive! I've mostly used coloured Conte because they're small and can be carried easily outdoors in their little plastic case, but now and again I've used Inscribe. The box of Unison I bought on a trip to their factory several years ago, is still in pristine condition - they look so lovely I haven't dared disturb them! Unison pastels are gorgeous and velvety Lorraine - and how Harry can leave his unused I just don't know!!!! 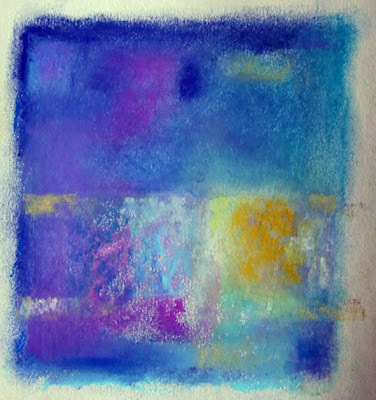 I have an old set of nu-pastels that have mostly collected dust due to occasional use. You are making me re think this. These are rich and I love how you use just a touch of one more intense flavor of color for interest and movement. I'm sure you know how to clean them with ground rice? Ok, rice and "dusties" here I come. Thanks. I promise to get those Unisons out real soon now, Vivien.